WOOSTER, OH – Our dedicated Mineralogy students appeared in the lab bright and early this morning for an optional sample prep session. 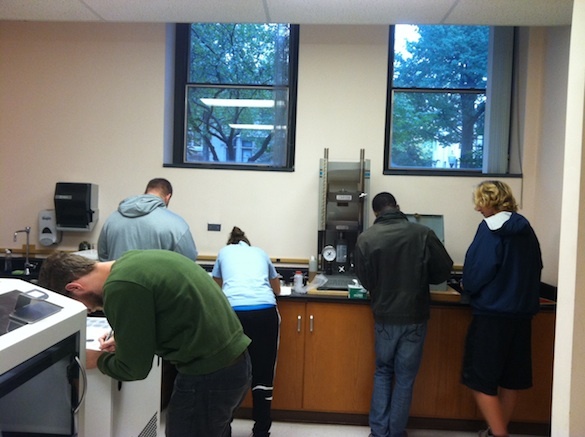 Wide-eyed and alert in the early morning hours, the Mineralogy students are diligently powdering their samples for XRD analysis. Each student has an unknown mineral that they are studying in a semester-long research project. Most of the work involves using modern analytical techniques for identification. Not all samples are well-suited for every technique, though. All of the students have been able to describe the physical properties of their sample, but only some can observe the crystallography. Some students are starting to use optical methods while others are using the XRD. Eventually, a few students will get to analyze the chemistry of their samples by XRF. As with any research project, some students are struggling with uncertainty: “how am I supposed to be sure about the identification of my mineral?” That’s a fantastic question, and one that we are constantly engaging in our I.S. program. The answer is that the best identification is the one that is supported by the evidence. By using a variety of techniques, the students should become more confident in their identifications. Instantly, students see the advantages of some methods. In fact, one student asked if it was “cheating” to use the XRD to identify his/her mineral. No, it’s not cheating. It’s called data.